How did Palau get its name? The name Palau comes from the Palauan language. Belau, is the word for village, as is beluu or aibebalau, which relates to a creation myth. The name in the English language took a journey from the islands’ heritage. The Spanish called it Los Palaos and then the Germans named it Palau. Today, the official name is the Republic of Palau. Palau officially became a sovereign state on October 1, 1994. Palau is made up more than 200 volcanic and coral islands, many of them surrounded by a single barrier reef in the western Pacific. It is part of the larger island group of Micronesia and shares its maritime boundaries with Indonesia, the Philippines and the Federated States of Micronesia. The first inhabitants of Palau date back to 2500 BC where they are believed to have come from present day eastern Indonesia. They perfected their fishing, farming and developed complex social systems. Captain Henry Wilson from England, became the first westerner to visit the islands when his vessel shipwrecked off shore in 1783. In 1885, the Spanish asserted claims to the islands but that was short lived as the Spanish sold the islands to Germany in 1899. The Germans did much to exploit the islands’ natural resources. Phosphate mining began and coconut plantations popped up everywhere and cultivated for export. When the Germans were defeated after World War I, the Japanese took over the islands. Their reign only lasted until they lost the war in World War II. A fierce battle between the US and Japan took its toll on the islands of Palau. Many ship wrecks resulted, which are now dive sites, as well as too many lives lost, on both sides. In 1947, Palau became a United Nations Trust Territory under the US administration until their Independence in 1994, as did several other Pacific nations. Today they are independent under the Compact of Free Association with the US. The US is responsible for their defense and financial aid and the US has the right to operate military bases on the islands. The US dollar is the official currency of Palau and English is the official language, along with Palauan. Despite all these outsider influences on the islands, monoliths and other relics are reminders of ancient culture and traditions that once thrived on the islands. Today, Palauans hold strong to their heritage. Although there are over 200 islands, only a few are inhabited. The Koror Island is the hub where 2/3rds of the 21,000 inhabitants call home. The ethnic makeup of the islands is a mix of Micronesian, Melanesian, Asian and Western elements. Koror is the main city and the economic hub and was also the former capital. However, in 2006 the capital was moved to Ngerulmud, which is located on the nearby island of Babelbaob. The other two satellite islands are Malakai and Ngerkebesang. Tourism is the main economic driver for Palau. Subsistence farming and fishing are also contributors to their economy. The government is by far the largest employer on the islands. A traditional government operates in conjunction with the federal government which sometimes creates conflicts, mainly over land rights. Traditional matrilineal practices remain prevalent in nearly every aspect of Palauan life. This is especially seen in funerals, marriages, inheritance and the passing of traditional titles. One of Palau’s most important cultural symbols is the bai. This is an impressive thatched, gable-style building that is the center of political and social life. The beams are decorated with carvings that depict the life and the histories of the villages. Today replicas called storyboards are sold to tourists as wonderful mementos of the islands. 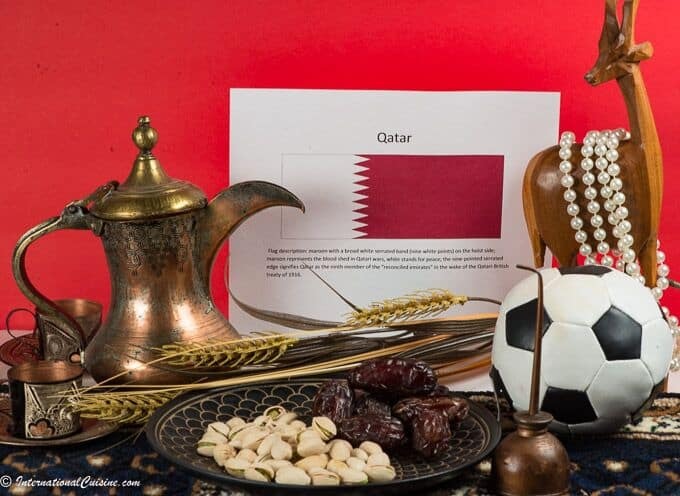 Shell jewelry, watercolors and weavings are also popular tourist items. Traditional dance, especially by women formed in two lines, is considered an art form. The men’s typical line dance includes war stances using sticks. Palau is home to the most pristine waters in the world. Most people go there to dive or snorkel and enjoy the breathtaking, white sand beaches that dot the islands’ coastlines. Palau was the first country in the world to establish a shark sanctuary, in 2009. They are also home to a lake called Jellyfish Lake. It is located on the island of Eil Malk which is part of the uninhabited Rock Islands in Palau’s southern lagoon. The Rock Islands’ southern lagoon was listed into the UNESCO world heritage sites in 2012. The unique Rock Islands are rounded knobs of forest-capped limestone that plunges steeply into the sea. Jellyfish Lake is connected to the ocean through fissures and tunnels in the limestone of an ancient Miocene reef. It is a place where you used to be able to snorkel with the golden-colored jellyfish, that don’t sting. The lake is currently closed to visitors as the jellyfish were beginning to decline due to environmental issues. They hope to be able to reopen it when the jellyfish are replenished. Another popular area is called the Milky Way, also located in the lagoon, amongst the Rock Islands This area is known for its white, limestone mud found on the water floor. It is believed that it will make you look ten years younger if you lather it all over your face and body, let it dry and then rinse it off with a swim in the lagoon. Palau’s economic growth is tied to its conservation legacy. Its marine sanctuary ensures a vibrant future for the nation’s marine life and for its economy for years to come. That is, as long as climate change doesn’t take its toll on the islands. The President of Palau has to look no further than his own backyard. When there is a full moon, due to rising sea levels, the garden his wife used to keep at the back of their house gets flooded with salt water by the high tide. “We no longer have flowers. We had to put them in a pot and when there is a high tide, we move them.” According to data from the United Nation, low-lying, small islands in the Pacific are disproportionately at risk of losing land as sea levels are expected to rise by 10-32 inches by the late 21st century. Palau has begun looking for alternatives to relocate its population to higher ground, before it’s too late. As we look into the cuisine of Palau, it comprises what they are able to grow and catch in the surrounding Pacific Ocean. Root vegetables like taro, pumpkin, and yams are prevalent. Pandan, with its unique aroma and sweetness is widely used in cooking and desserts. Colorful, exotic fruits are plentiful, such as: dragonfruit, mango, passionfruit, breadfruit, the very healthful soursop and the queen of fruits, the rambutan. Of course, coconut is abundant and used for flavoring everything from fish to soups. Rice is commonly served at mealtime. An interesting island tradition there, is that women are the only ones allowed to harvest taro. 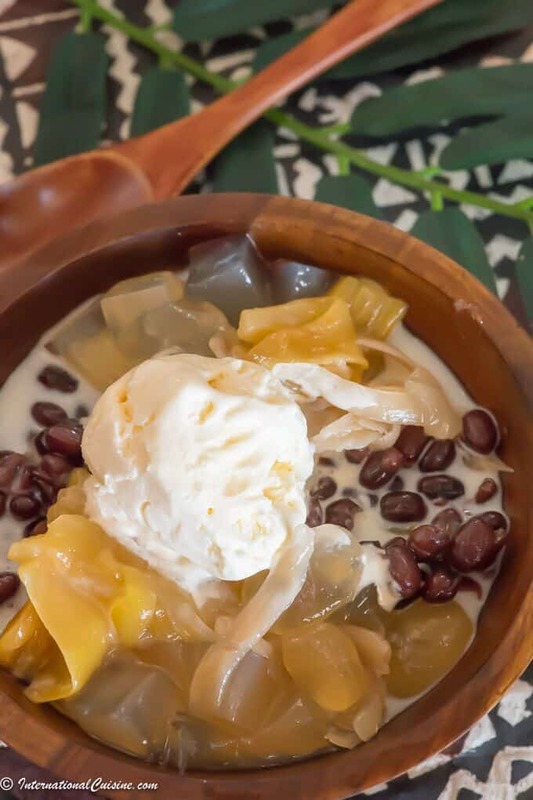 One unique dish you will find in Palau is fruitbat soup where the fruit bat wings and head are cooked in a broth of coconut. Fish from the sea are cooked in all different ways and also eaten raw. The cuisine has influences from America, Japan, the Philippines, Indonesia, Malaysia, and other Pacific Islands. 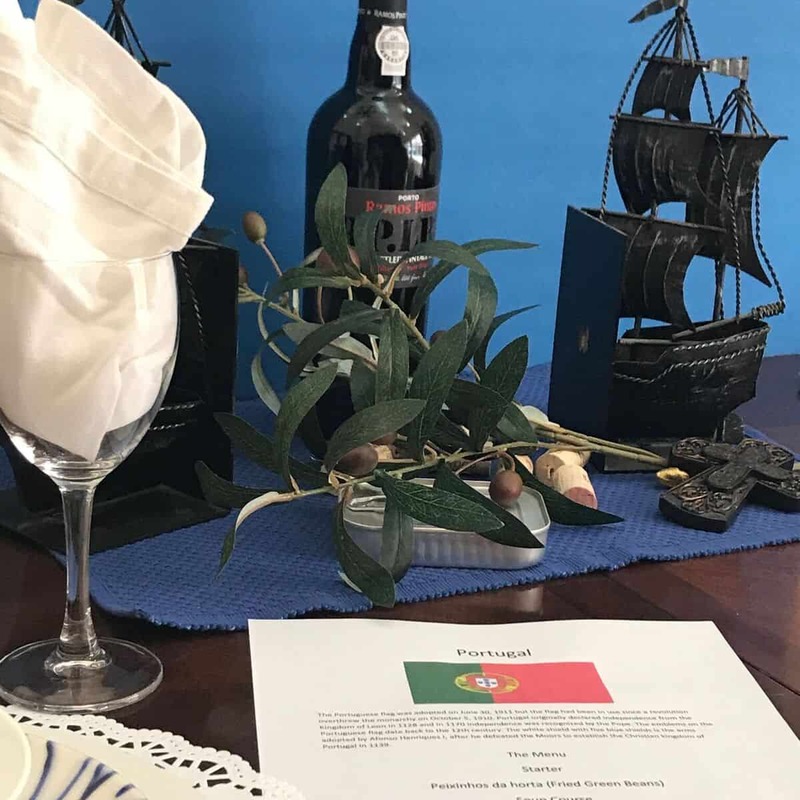 A few specialties are: Tinola, a soup made with chicken, papaya and ginger, Ulkoy, a deep fried shrimp and squash fritter and Pichi-Pichi, a dessert made with coconut and cassava. We set the scene with plumeria. 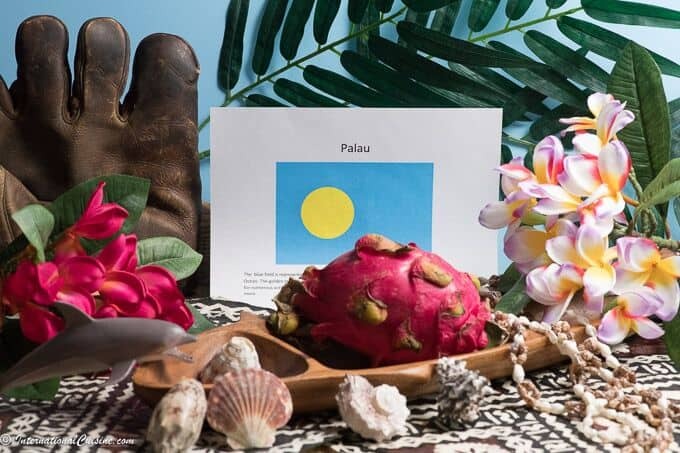 the fragrant national flower of Palau. We decorated with a shark figurine and sea shells, representing the shark sanctuary and the stunning marine life. A baseball glove represented baseball as the national sport, which was brought to the islands by Japan in the 1920s. Lastly, we added tropical fruit and a grass cloth covering, along with tapa rounds to complete the island feel. We began our meal with a tuna poke salad. Tuna is abundant in the waters of Palau and I absolutely love raw tuna. This dish is inspired from the Hawaii Islands in the USA. It is an absolutely delicious salad and is very versatile. 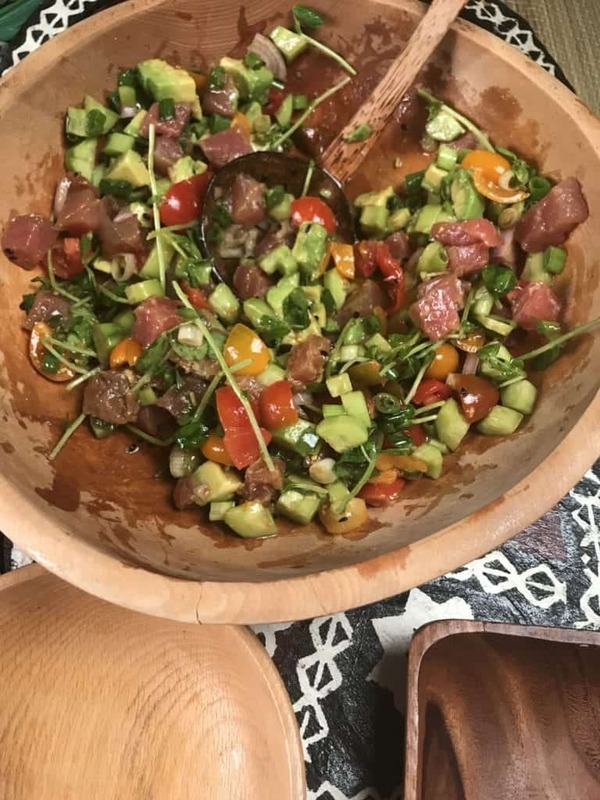 It has avocado, tomatoes, cucumbers, shallot, scallions and pea sprouts, with diced up, sashimi grade, tuna. It is dressed with sesame oil, light soy sauce, lime, a hint of chili powder and black sesame seeds. Heaven in a bowl. 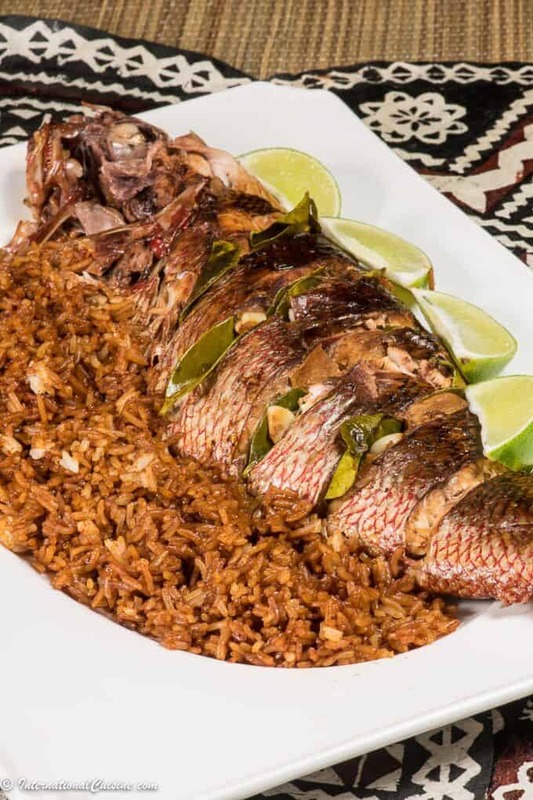 For the main course we made a whole snapper. It was grilled in a banana leaf and stuffed with kaffir lime leaf, garlic and ginger. It was covered in a mixture of dark, mushroom-flavored soy sauce and sesame oil. The fish was grilled for about 15 minutes (until tender and flaky.) We served the fish whole, with white, steamed rice, flavored with the same mushroom, soy sauce and sesame oil. The result was a quick, easy and sumptuous main dish that makes you feel like you are on a tropical island. We loved it! After dinner we decided to treat ourselves to a mud spa. Although I could not get the Milky Way mud, I did find a spa mud, in hopes of looking ten years younger. If it doesn’t do the trick, a trip to Palau is in order. If you haven’t yet, please be sure to join the culinary journey around the world so you don’t miss a thing, it’s free!